NASA Administrator Charlie Bolden will review the findings of his “special team” – which he set up to evaluate all Heavy Lift alternatives to the current plan – on Friday. Pre-empting the overview, Exploration Project officials all-but ruled out the Sidemount HLV, whilst noting a couple of In-line heavy lifters – one of which appears to be a DIRECT Jupiter launch vehicle – made it through to the Bolden meeting. Only snippets of documented information have been noted on NASA communications so far this month, although an executive decision point – headed by President Obama – is believed to be just around the corner. While transportation of crew to the International Space Station (ISS) requires direction – with the current plan to retire the shuttle fleet in 2010 or 2011, move to a reliance on the Russian Soyuz, until the US regains its own capability via either Ares I or a commercial launcher – the key to NASA’s future revolves around a heavy lift launch vehicle. With Ares I’s chances of survival in serious doubt, its related Ares V heavy lifter also became the subject of whether to continue development, or change direction to one of several heavy lift alternatives – as was discussed at the Augustine Commission’s review into the future of NASA’s Human Space Flight program. Space Shuttle Manager (SSP) John Shannon was tasked with setting up a team to evaluate the SD HLLV (Shuttle Derived Heavy Lift Launch Vehicle – or HLV for short) due to the commonality with the existing shuttle stack. Regular updates in the twice weekly Shuttle Standup and Integration report noted good progress had been made in refining the sidemount design, as the evaluations moved into meetings with the Langley Research Center (LaRC) and NASA HQ in Washington, DC – ahead of key ‘face-to-face’ meetings with MSFC (Marshall Space Flight Center). In tandem with the sidemount HLV evaluations, Mr Bolden directed a special team to evaluate all heavy lift alternatives, allowing the team to score each concept against each other on specific mission goals. It appears that those evaluations are now complete. Very little has been heard from the SSP Sidemount HLV evaluations since the turn of the year, until this week, when the MOD’s (Mission Operations Directorate) Exploration Project Office made a reference to the Friday review with Mr Bolden, citing Ares project manager Jeff Hanley. “HLV study summary from (Mr) Hanley – Sidemount doesn’t buy anything and takes hit on safety. A couple of versions of In-line going to Bolden on Friday,” noted the memo (L2), which was part of a MOD managerial overview of recent activity. As to which In-line vehicles were being referenced, the only concepts that have received positive attention are variants of vehicles that are not unlike the appearance of an Ares V, one of which is understood to be a Jupiter-241 Stretched Heavy. No further mentions – other than in the NASA Flexible Path findings presentation – have been made to the monster 200mt Heavy Lifter. 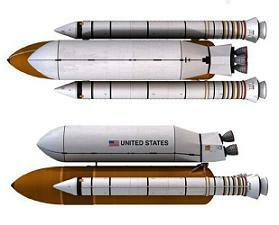 Sources expanded on the vehicle that appears most favorable per evaluations, noting an In-line SSME (Space Shuttle Main Engine) based vehicle, which has a Block-I configuration of 2x 4-seg SRB (Solid Rocket Booster – with 5th segment ‘spacer’), 8.4m Stretched Core powered by 4x SSME Block-II, an Upper Stage powered by a cluster of 4-6x RL-10A-4-3, and an EDS (Earth Departure Stage) optimized for LOR (Lunar Orbit Rendezvous). The Block-II version of this vehicle would consist of 2x 5-seg SRB, 8.4m Stretched Core powered by four expendable SSMEs, with an Upper Stage powered by either a cluster of 4-6x RL-10A-4-3 or a single J-2X, and EDS optimized for LOR. 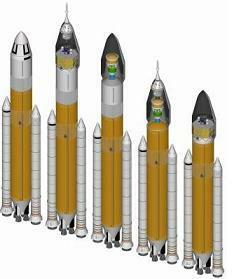 The RL-10A-4-3 variant is based on the RL-10B-2 currently flying on Delta-IV, modified with a fixed nozzle extension, instead of the current extending one. Until the actual vehicles are outlined in detail via official documentation – other than “In-line” – the specific configurations will remain unknown, and remain at the mercy of further evaluations – depending on Mr Bolden’s viewpoint after the Friday meeting. However, further clues – all of which back up the SSME based Heavy Lifter being favored – have been forthcoming. One such clue came during Thursday’s all-powerful Program Requirements Control Board (PRCB) meeting, where a proposal was put forward to delay the disposal of SSME assets, pending “future launch vehicle architecture” decisions. While assumptions could be made the presentation relates to ether a shuttle extension, or a stretch of the manifest past the current retirement date with additional flights, sources note the relation to the SSME-based Heavy Lifter, as outlined above. 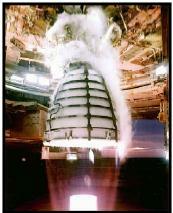 The presentation also lists a series of four month slips associated with the retirement of assets – which would allow for breathing space as NASA finalize their decisions on the future launch vehicle architecture, whilst dedicating a page to the timescale it would require to actually replace/restart SSME production – citing one to two years. “Recommendations: Delay disposal of New Production capability assets disposal until June 1, 2010. Minimize risks to on-going Launch Vehicle architecture considerations,” added the presentation, again making no mention of a shuttle extension in any part of the document. The irony remains that such a change of direction to a true Shuttle Derived vehicle would aid a shuttle extension. However, with an extension to 2015 all-but dead, the only viable approach would be a 2012 extension with around three additional flights – with the clock ticking down on even that viability.